We needed to be more consistent and transparent as we monitor, track, and report on projects and activities across our plants. AchieveIt gives us the ability to easily and consistently access project information, address weak spots, and share status updates across the organization. Now, we can focus on the work and not spend hours compiling information. Successful power, water, natural gas and other utilities providers are looking to improve operational excellence and risk management tracking across multiple plants in a region. Through working with some of the companies at the forefront of this movement, AchieveIt has been able to change the way thousands of employees are kept safe on the job and is helping realize huge efficiencies in risk management processes. Those in the utilities industry are tasked with the challenge of tracking compliance adherence and risk management across several plants. This can be cumbersome, especially with the pressure and necessity to consistently develop more efficient and safer processes. In most companies, this responsibility lies with one senior executive, who is often overwhelmed by leading these initiatives while still serving customers. Typically, this data exists in monstrous Excel spreadsheets and PowerPoint slides that someone has to manually compile and analyze in order to see which initiatives are struggling and what adjustments should be made to get things back on track. Utility companies across the globe struggle with viewing initiative progress as part of a bigger picture. With complex and inefficient reporting practices, the language of success is difficult to understand. Oftentimes, longer-term strategic projects can’t even get off the ground because so much time is consumed just by trying to get a snapshot of progress. The obligation to find a better solution to track plan execution is becoming more evident with the increase of competing priorities. Now, utility leaders are finding more time in status updates meetings to address items that need help, instead of spending time trying to understand their current positions. The uniformity, standardization, and consistency AchieveIt provides is helping teams reclaim and reallocate valuable time. A handful of utility companies using AchieveIt have even found other use cases. These organizations now use AchieveIt to gain a higher level of transparency between plants in other regions, enabling the exchange of ideas and best practices. These organizations have made the cultural shift toward execution. Across the board, plant managers and others responsible for reporting have saved countless hours, and are applying that time to executing their plans. 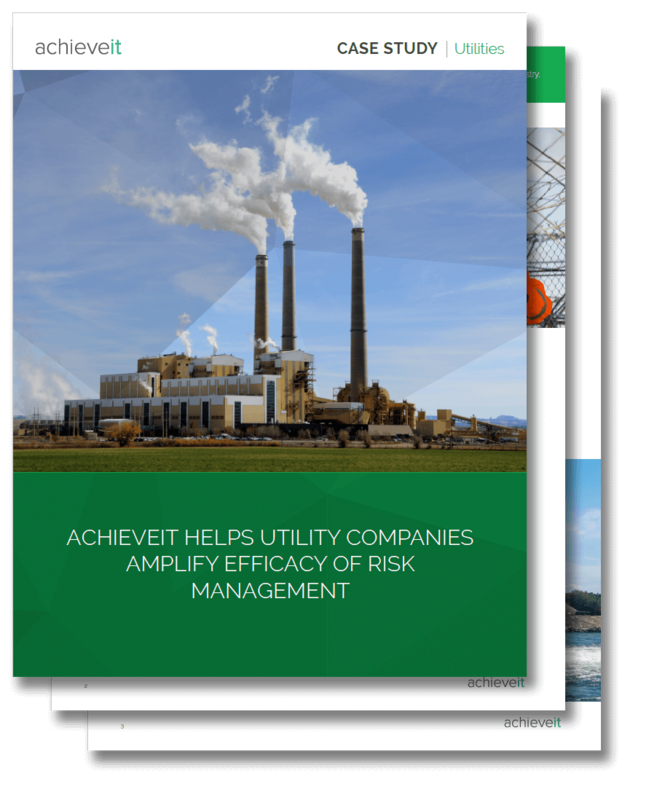 Download this case study to learn how large utility companies are using AchieveIt to gain visibility across multiple plans, dedicate more time to solving problems than gathering data, and enable more predictive and proactive decision-making.